PERRIS, Calif. (WPVI) -- Thirteen victims, ranging in age from 2 to 29 years old, were kept shackled to their beds amid foul surroundings in a Perris, California home by their parents, sheriff's officials said. KABC-TV reports, early Sunday morning, a 17-year-old girl escaped from the residence, located in the 100 Block of Muir Woods Road and called 911 from a cellular device she managed to take from the home, investigators said. That teen told the 911 operator that she and her 12 siblings were being held captive in their home by their parents. When investigators from the Perris Police Department and the Riverside County Sheriff's Department met with the girl, they said she looked emaciated and only 10 years old, though she was 17. 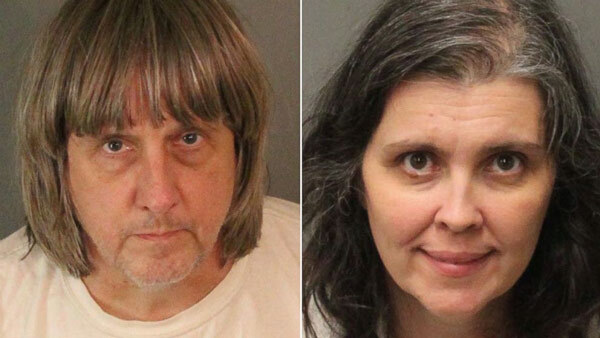 After interviewing the girl, investigators contacted her parents, 57-year old David Allen Turpin and 49-year old Louise Anna Turpin at the home from which the teen escaped. Further investigation revealed several children shackled to their beds with chains and padlocks in dark and foul-smelling surroundings. However, the parents were not able to immediately provide a reason why their children were restrained in that manner. Deputies located what they believed to be 12 children inside the house - but were shocked to discover that seven of them were actually adults, ranging in age from 18 to 29. The victims appeared to be malnourished and very dirty. There were 13 victims total -- 12 in the house, and one who escaped and called 911. The victims, who ranged in age from 2 to 29 years old, were transported to the Perris Station and interviewed. Both parents were detained and transported to the station for further investigation. Child Protective Services and Adult Protective Services arrived to assist in the investigation. The victims were provided with food and beverages after they claimed to be starving. Both parents were interviewed and subsequently transported to the Robert Presley Detention Center. They were arrested on suspicion of torture and child endangerment. Bail was set at $9 million each.